​In 2012, a Black teenager named Trayvon Martin took a route through a gated community in Sanford, Florida on his way home. Suspecting the teen was "up to no good," the local neighborhood watch coordinator George Zimmerman began following him and a short time later confronted him. A struggle ensued, at which point Zimmerman drew a gun, and fatally shot Martin. The incident gained widespread attention, but after Zimmerman was acquitted of the homicide, national protests erupted. For some, the protests were about ridiculing the draconian "stand your ground" statute, which Zimmerman relied on as justification for his use of lethal force. For many Black Americans, however, the protests were about shining a spotlight on a racist criminal justice system and affirming the basic truth that Black lives matter. The Black Lives Matter movement was born from the murder of Trayvon Martin, but so too was the hashtag, which has been invaluable in spreading news of police violence. As movement co-founder Opal Tometi has noted, #BlackLivesMatter is "an affirmation for our people. It's a love note for our people, but it is also a demand." In the months and years that have followed, protestors have continued to target the institutional racism of a criminal justice system that seems intent on proving the protestors' point. ​​In July 2014, due to suspicion of a petty crime, New York police officer Daniel Pantaleo put Eric Garner, a 43-year-old Black man, in a lethal chokehold. In August of that same year police officer Darren Wilson of Ferguson, Missouri, fatally shot unarmed Black teenager Michael Brown. Despite the view shared by many that in both cases there was ample evidence to justify indicting the officers to stand trial, the officers were never indicted. Protestors have been galvanized by these events, and have continued to organize under the rhetoric of "Black lives matter." 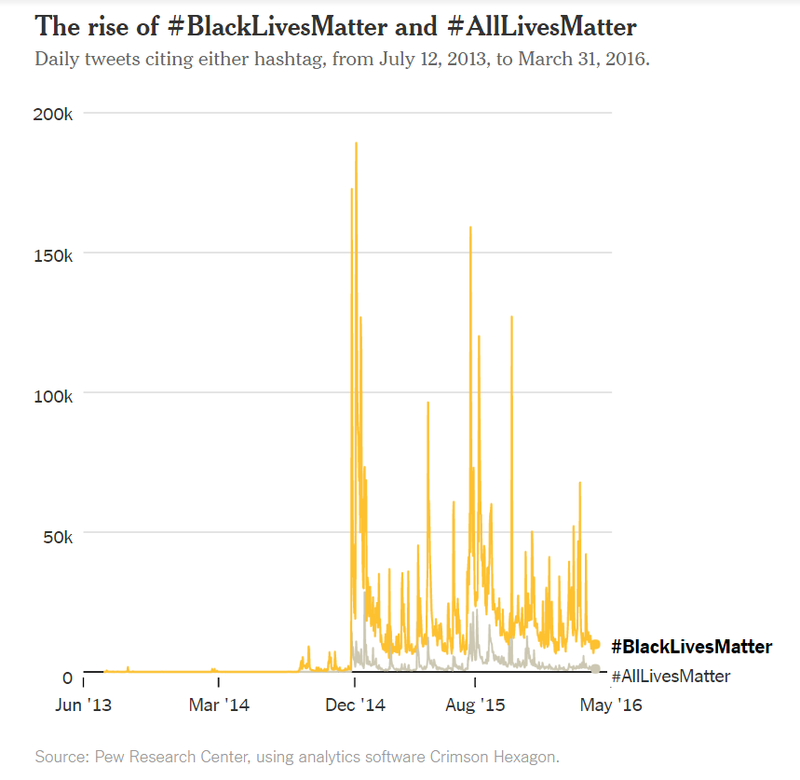 As this chart from The New York Times shows, the pulse of the #BlackLivesMatter hashtag first jumped on July 17, 2014, when police killed Eric Garner, and then again on August 9, 2014, when officer Darren Wilson shot and killed Michael Brown. However, these first few tentative blips were only a warm up to what happened late in November of that year when Cleveland police fatally shot 12-year-old Tamir Rice. See more charts on the Black Lives Matter movement here. 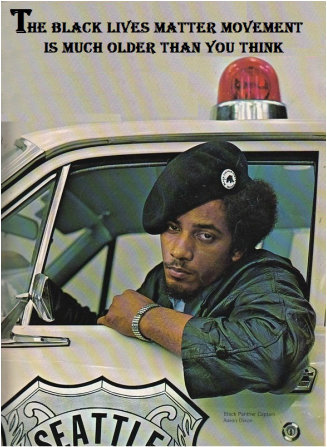 In this short video post, sociologist Lester Andrist draws on a New York Times video of the Black Panther Party to illustrate that Black Lives Matter is actually a continuation of the work started by the Black Power movement. Check out this curated Pinterest board for images related to the Black Lives Matter movement. Use these pictures to inspire conversation about the movement. See more here. 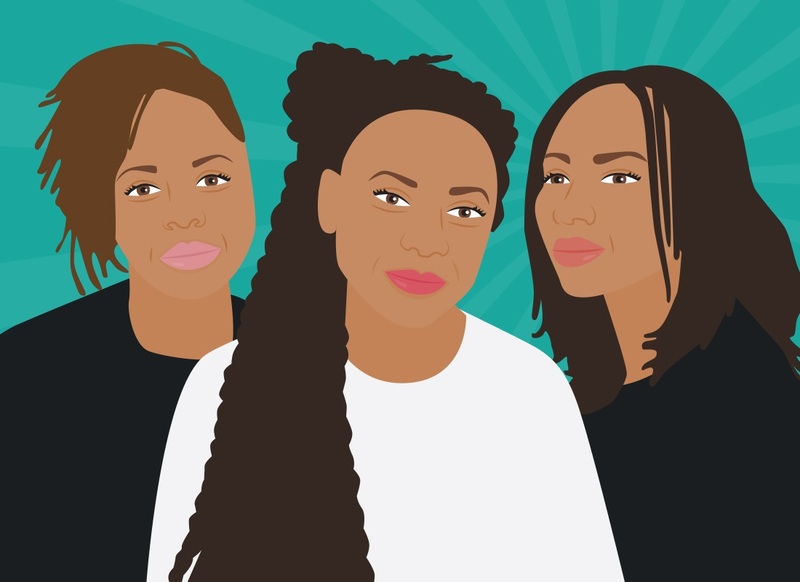 ​Patrisse Cullors (1983), Alicia Garza (1981), and Opal Tometi (1984) are the three activists credited with starting the Black Lives Matter movement. After George Zimmerman was acquitted in the killing of Trayvon Martin in July 2013, Alicia Garza posted on Facebook, "Black people. I love you. I love us. Our lives matter, Black Lives Matter." Patrisse Cullors was then the first to share the post with the hashtag #BlackLivesMatter. Opal Tometi later joined Garza and Cullors and has played a vital role in establishing the movement's presence on social media. Each of these women has expressed in interviews that their struggle to affirm that black lives matter is both urgent and deeply personal. For instance, Patrisse Cullors has noted that her struggle for African American rights stems in part from her 19-year-old brother being brutalized during his imprisonment in Los Angeles County jails, and Alicia Garza has mentioned that she was deeply affected by the killing of Trayvon Martin and felt that it could have easily been her younger brother. 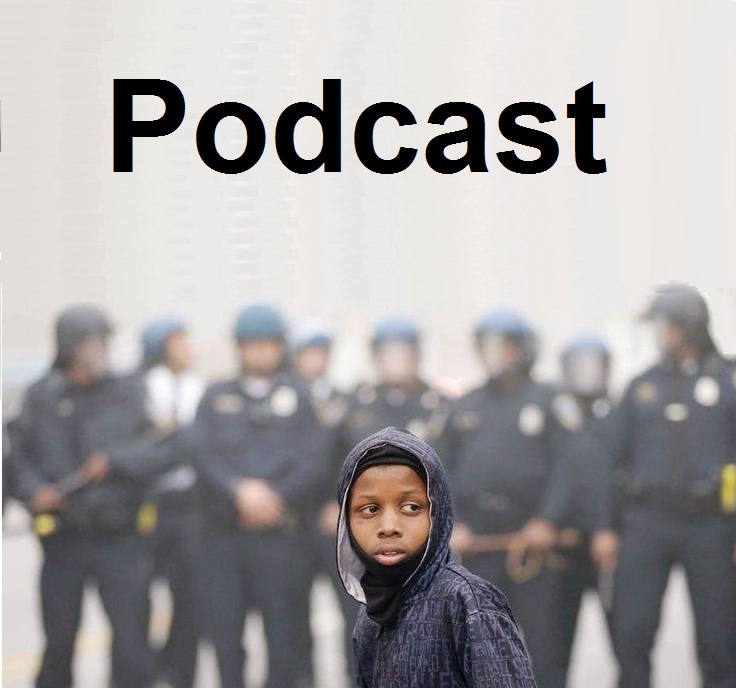 In this podcast Lester Andrist interviews sociologist Rashawn Ray about the success of the Black Lives Matter movement and whether it will continue to be an effective force for promoting social and political change under a Trump presidency. Activists associated with Black Lives Matter launched Campaign Zero in August 2015, which is described as a "data-driven platform" with the goal of ending police brutality. Specifically, the site outlines ten policy proposals that are aimed at limiting police interventions, improving community interactions, and ensuring accountability.